I have been a bit of a scatterbrained naturalist in the last few days. The common denominator of the critters I've been enjoying is wings. Sometimes I'll scrounge up enough material from one outing and it can flow nicely, but I've been forced to stitch together shots from the pond outside my place, my deck light at night, and Saanichton Spit. I'll still rock this chronologically, so a nice moth I encountered a few nights back is the starting point. I encountered my first member of the genus Plusia a few weeks back - it was a sharp little moth with a gleaming white stripe on its wings, which has the appropriate common name of White-streaked Looper (P. venusta). Shortly after, I found a moth resting on Yarrow (Achillea millefolium) and was immediately struck by the contrast of its two white spots on each wing against a pastel wash of burnt sienna and lavender. 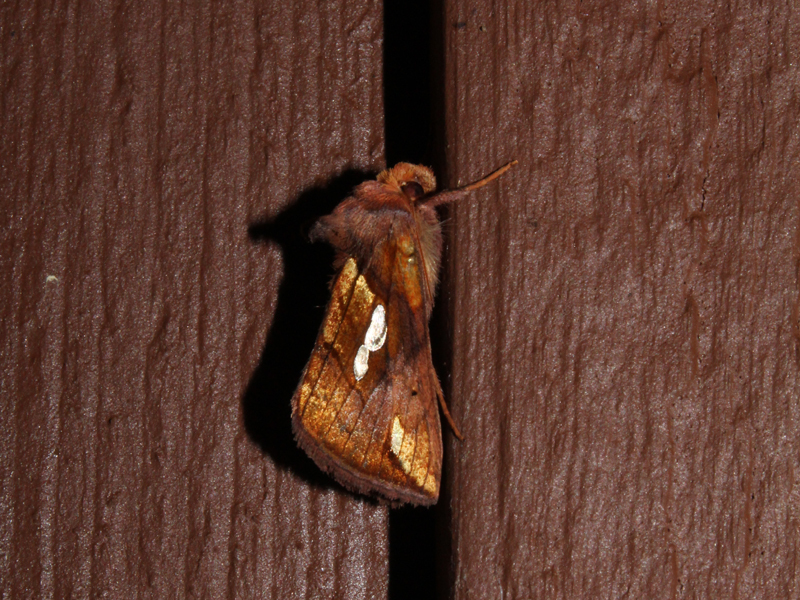 I pored over the Moths of Canada plates and was surprised to see it was Putnam's Looper Moth (P. putnami). That was an incredibly roundabout introduction to say I encountered my third species of Plusia under my deck light: P. nichollae. 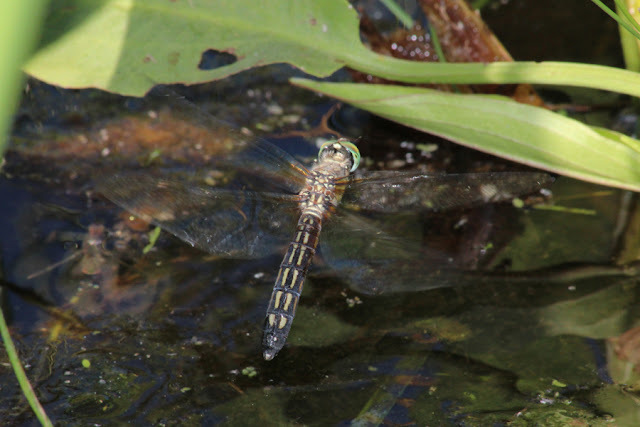 Around the pond outside my place, I continued to see Blue Dashers (Pachydiplax longipennis). They are so showy with their turquoise eyes that I couldn't help but snap more photos. I also enjoyed watching two males vying for territory around a female. One of them must have been a lucky suitor as I observed the female ovipositing in the shadows. I put the flash on and managed a shot of her hovering just above the water. I find all Blue Dashers pretty special, but she must be hot because two males were fighting over her! 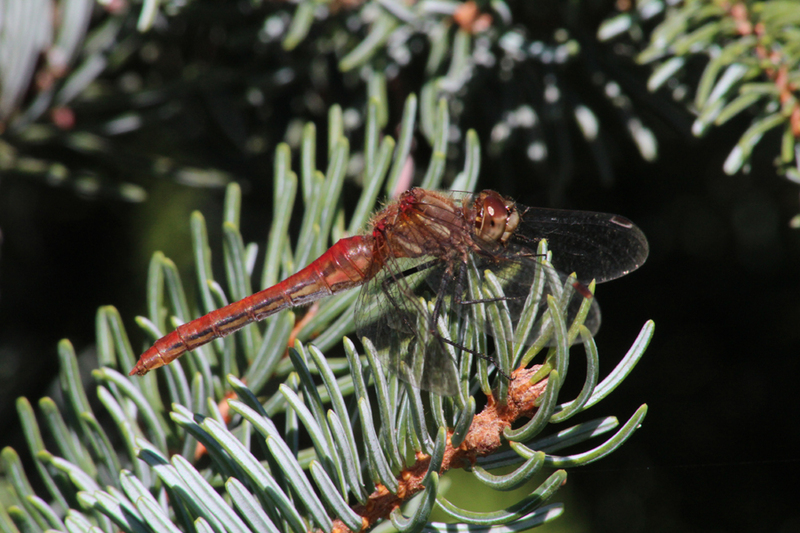 While watching the Blue Dashers, I noticed a female Striped Meadowhawk (Sympetrum pallipes) that landed in one of the conifers beside the pond. I decided to leave the Blue Dasher ménage à trois and take some shots of the meadowhawk. 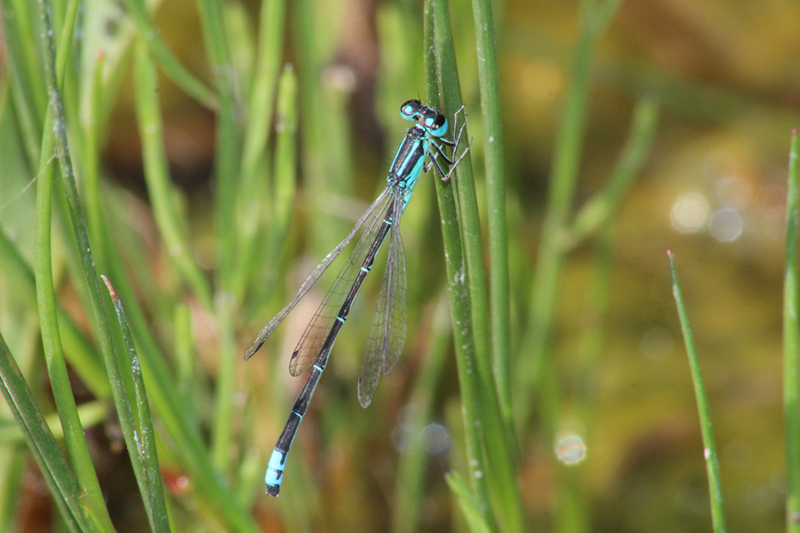 I also noticed a diminutive Western Forktail (Ischnura perparva) at the pond's edge. They can be found flying alongside Pacific Forktails (I. cervula), but are easily distinguished by the two stripes on their thorax as opposed to four spots found on Pacifics. I haven't really had much luck taking photos of damselflies, but I thought this one turned out not too shabby. Most forktails in our region have mostly black abdominal segments with two or three blue subterminal segments. 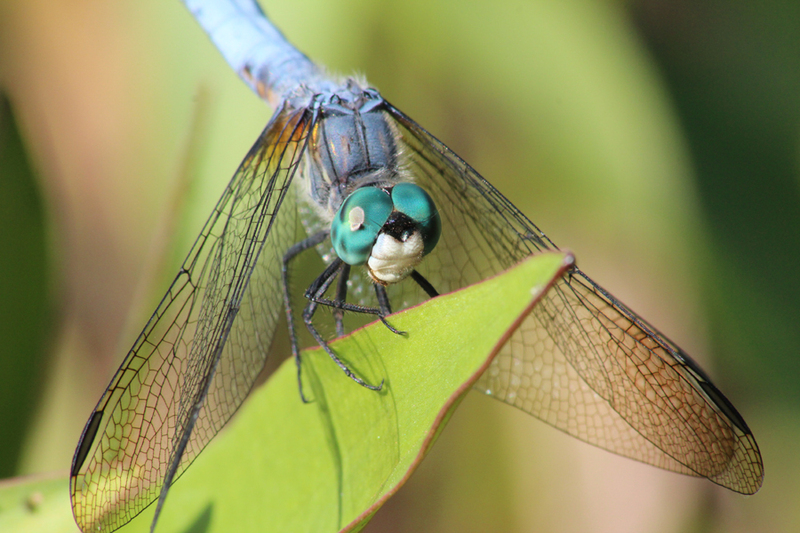 Western Forktails have two thin blue dorsal stripes on their thorax and S8 and S9 are blue. After a couple laps around the pond, I had a quick outing at Saanichton Spit. 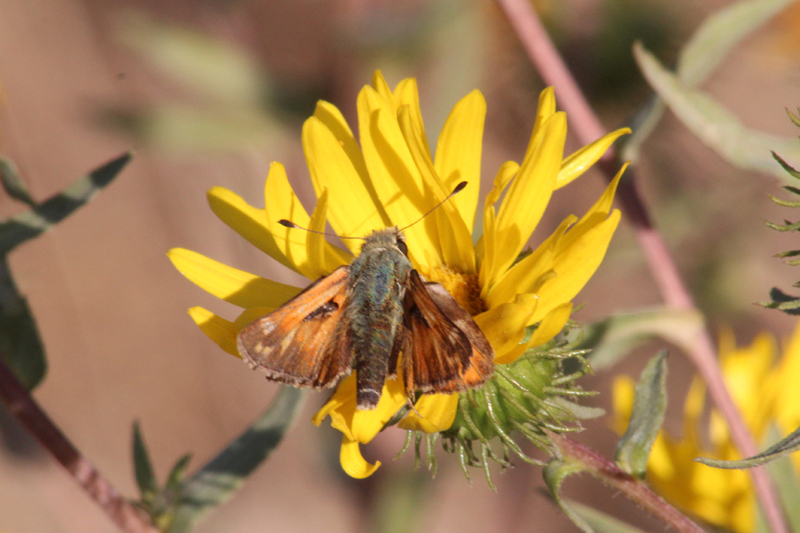 I was hoping to encounter Oregon Branded Skippers (Hesperia colorado oregonia) and was not disappointed. I found four in total during my walk out on the spit with very little effort. I took a few shots of one and I am not terribly impressed with any of them, but will put one up anyways. Oregon Branded Skippers are typically found in Garry Oak habitats, so the population at Saanichton Spit is anomalous comparatively. At the spit, I often find them nectaring on Puget Sound Gumweed (Grindelia stricta) and that's exactly what I captured in my shot. I came across a different species of meadowhawk near the base of the spit and it's one I enjoy for breaking the mold of the typical meadowhawk pattern. 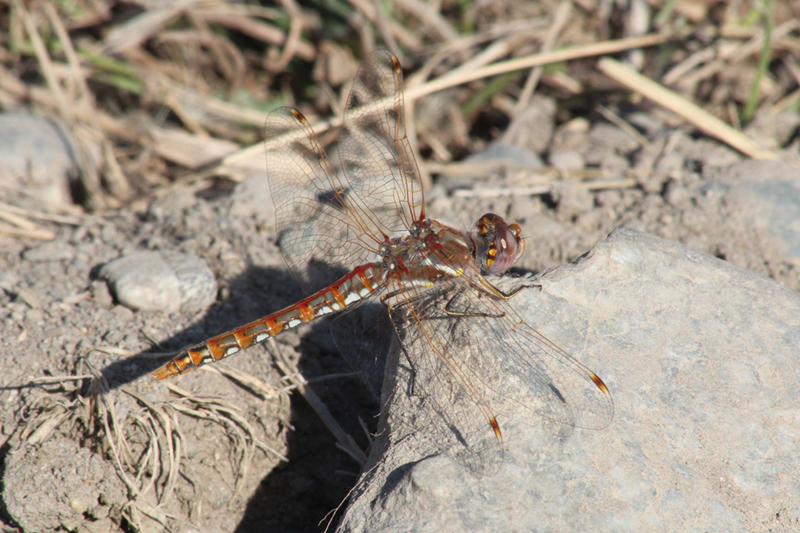 Most meadowhawks around here are red, but Variegated Meadowhawk (Sympetrum corruptum) more intricately patterned. I was also hoping to encounter some shorebirds at Saanichton Spit and managed to get some results in that department as well. I certainly didn't find anything overly interesting, but the flock of forty or so peeps was more than I anticipated based on recent reports from there. 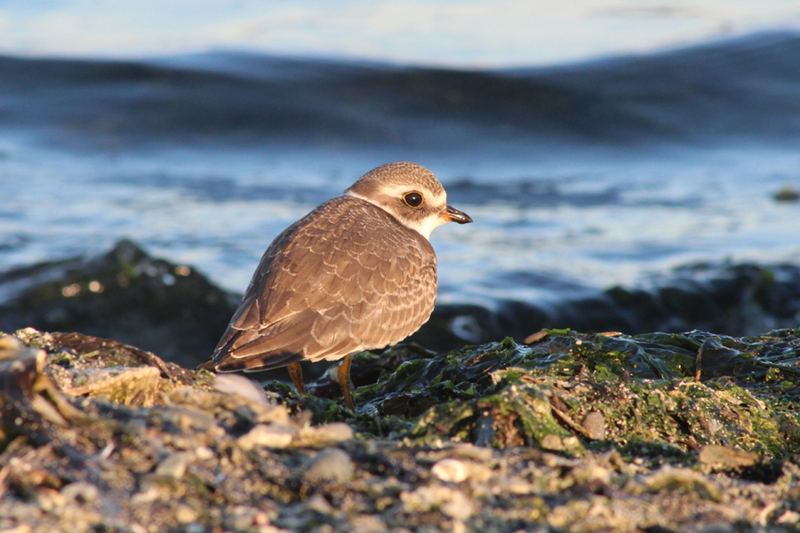 My highlights were two Semipalmated Plovers (Charadrius semipalmatus), eight Red-necked Phalaropes (Phalaropus lobatus) putting along the tide rip, a Peregrine Falcon (Falco peregrinus) flying over to James Island, a Merlin (F. columbarius) at the base of the spit, and five Western Grebes (Aechmophorus occidentalis) cruising through the strait. The plovers were the only birds cooperative enough to let me get a shot and said shot will conclude this post.